Bailie Riggs, Makayla Franks, and Angie Ramos conduct interviews. 2019 Course & Spring Break Praxis with Hamilton College’s Department of Anthropology, The Days-Massolo Center, and the Digital Humanities Initiative. Apply to “Experiencing Empathy” to learn more about the culture and cultural history of New Orleans through the lenses of space, place, memory, and representation. We meet each Wednesday of the Spring the semester for discussions of readings, empathy exercises, and development of research methods and technology skills. 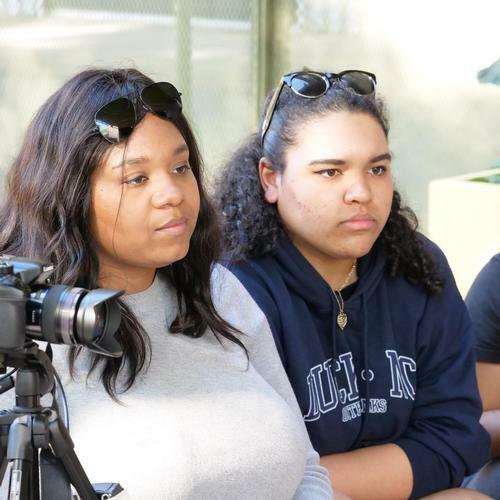 The first week of Spring Break is a research trip to New Orleans to apply research methods and gather data that will be used to construct multimodal presentations on the research topics explored in New Orleans. This experience is limited to eight students and is open to sophomores through seniors through an application and interview process. Application instructions and call for proposals will be sent to campus in late November. Selected students will be notified by the January 30, 2019. Read & research articles exploring aspects of the current culture and cultural history of New Orleans. Participate in “empathy” sessions designed to connect cognitive and emotional knowledge acquisition. Develop research questions and learn appropriate methods and digital technology skills. Learn digital humanities and social science research methods and ethics. Learn common multimedia production workflows and basic pre-production and production, post production skills. Learn how to document and develop authentic and ethical, digital representations of other's perspectives with the goal of conveying empathy. Utilize photo/video/audio to document current day New Orleans and construct multimedia publications based on research themes. Develop multimodal presentations, including qualitative and quantitative data from research, to be delivered in class and published online May 2018. Summer 2019 - potential to work with experts to translate real life experiences into virtual reality experiences using virtual reality (VR) technologies. Course & Spring Break Praxis with Hamilton College’s Department of Anthropology, The Days-Massolo Center, and the Digital Humanities Initiative. Apply to “Experiencing Empathy” and spend time with us as we travel to New Orleans, utilizing research and technology to experience and tell the story of the education landscape post Hurricane Katrina. This experience is open to sophomores through seniors. Read articles about education structure & reform in New Orleans since Hurricane Katrina. Participate in “empathy” sessions.Research aspects of education in New Orleans. Review selected oral histories by educators from New Orleans. Learn oral history interview methods and ethics. Develop storyboards over winter break on select oral history video segments. Develop interview questions to obtain short (30-60 min) first person oral histories. Videotape the oral histories of interviewees. Utilize photo/video/audio to document first person perspectives based on individual oral history interviews. Develop narratives to be translated into VR vignettes that allow first person experiences of education in New Orleans. Translate real life experiences into virtual reality experiences using virtual reality (VR) technologies.